Cindy Bandy O’Brien has worked in the early childhood field for nearly 40 years as a teacher, specialist and mother (although her children quickly outgrew her specialization!). She taught in Montessori, Head Start, and public school settings. With Head Start, she worked as a teacher, parent involvement specialist, education coordinator and curriculum specialist. 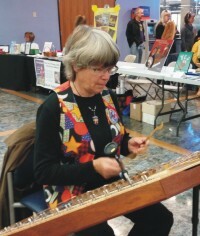 An award-winning author, O’Brien says she has learned so much from kids and has used that knowledge to create books and programs available at www.InTouchWithKids.com. Her stories reflect concerns from a kid’s point of view, with illustrations that will spark conversations about feelings and inspire children to do art with simple materials. O’Brien’s book, Agitated, was named best Self-Improvement Book (Ages 5 – 8) by the Mom’s Choice Awards, which honors the best in family-friendly products.